I have been busy of late. Like I need a new vehicle, house, computer, drone, camera, I am wearing them all out! I have been traveling so much my house is literally falling apart. My vehicle is driven so much it is literally showing all the places it has been. My computer is 6-year-old technology and still runs seemingly better than other guys who do this in the business of filming and editing. I threw away my drone that was a 3DR Solo, read, "Don't buy, don't buy, save your money!" And I lost a drone shooting some of the best footage of my life. My hope is that my viewers will enjoy all this and that will satisfy my every other shorting coming or thing that falls apart, is worn thin, or flies away. I do this all for you! Because hundreds of other men and women are in shops right now figuring it all out as well. How do I get better? What tire combination will leave as little dirt on the buckboard as possible? What gears can I run based on this soil composition or that specific sled operator? We are all working to put on a killer show for you. On this weekend I traveled 60 miles south and got to the grounds and it was soaked. The Field Days Staff work tirelessly to make sure pullers could get around the pits. I was able to park near my setup. I asked for permission to cut down a pole and it was granted. I took out my trusty Stihl saw and went to work. I swear I got 90% through the pole, gave it a push and the whole pole came up from the ground. Oh, the silly things I do to set up and get the best position possible for filming. This track is about 25 feet wide and no lines can be chalked. The bounds are the jersey walls. I literally set up right on the walls. To Night 1. A handful of tractors will hook on this night. It is all about one thing SEMIS! I never get to film them. I counted some 20 plus hooks from that class alone. There were several Dragon Motorsports points classes running. The Outlaw 4x4 trucks, 8000LB Pro Stock Diesel 4x4 Trucks, 12,000 Altered Farm tractors along with Street Gas and Street Diesel Trucks. We added to our 2018 Low Light Reel. Smoking clutches and a few bumps by the sled. The Outlaw 4x4 trucks featured several Fords taking home the best spots. Wesley Griffith dominated the 2017 campaign and did so again for 2018. He took home the class on the last hook going 324.07. I honestly can't remember if it was movie magic or simply editing that allowed him to take it on the last hook. A video guy in the business told me to do this every now and again, "Just put the winner the last hook, keep the viewers on their toes!". Thomas Alphin came in with Ford second going 322.55. He was your 2016 Outlaw 4x4 Champion for Dragon. And William Woolridge came in third with his "Down N Dirty" Ford going 319.39. Pro Stock Diesel 4x4 trucks have to be one of the most talked about classes going. I take 3 to 4 calls a week about the status of this class. Rules are great and they are voted on and run for 3 years. Then they sit down and decide what is next. Well with 4 trucks on this night, I was giddy. First came Brent Cooke out of Colonial Heights Va and brought his Black Sheep Cummins powered Ford sponsored by Cooke Auto Group to the line first. Cooke Auto Group is a class sponsor as well. Brent took the Ford 323.61 feet, a respectable distance. But, then Casey Rupe came next and laid down some big distance of 365.94 in his "Not Legal Yet" Dodge. Class points leader at the time, Greg Poore went next and went 348.79. Anthony Rezzonico came next on his Dodge Dakota style body truck and went 340.55. Plain and simple we do not know what the future holds for this class. It could turn into a 3.6 class. I could be 3.0 Smooth Bore PPL. It could stay the same and wait for the pullers who last voted to come around on their builds. Only time knows. Altered Farm tractors. I don't write about this class. It isn't that I don't like it, I do. It used to be a true Hot Farm class with a speed limit of 17MPH/27KMH. That class was the best. This class had ideas of going back to that with limitations of all pullers running a "Box Turbo" and that is an S-300 Borg Warner with a billet thrust bearing installed and a 2.4 inlet (http://dragonmotorsportsinc.com/vanilla_forum/discussion/645/2017-altered-farm-class). So the class has done fairly well with these changes. I am fairly sure the speed limit was set to 18MPH and since removed. First up was Tommy Eppert on hid Ford 8600 and went 281.29. He shut it down after his engine was spinning backward. Next came Brent Sayre and his clean International and he went 285.69. That was going to be the best on this night. Local legend Bill Balderson came later and ran a respectable 279.32 and Bradley Seal came with some blue power and went 279.32. Semis. We just don't shoot them enough. We are talking 6 pull mini-series for Hot Rod Semis, but it takes sponsors. We can talk about all kinds of things, but in the end, it all comes down to money. Who wants their logos on it? Who wants to be associated with/benefit from it? On this night you had an exhibition hook from Barbie Cox and his Demo Dog Mack. Three of these trucks were all built by the same shop, Demo Dog, Tim Carter's Poor Boys Mutt, Maxie Broadus' Walking Tall, all came from Dale Francis Shop in Mantua, Ohio. Barbie got the semi show started with a good exhibition run. Then the Hot Street Semis came to dig in the Richmond dirt. Nelson Gentry came first went 248 and some change. Mike Mathis now the caretaker for the above stated Walking Tall, came next on his road rig and went short of his desired distance. Rober Mathis came next and went 268.45. Emily Mathis came next on her 79 model International and went 287.92. 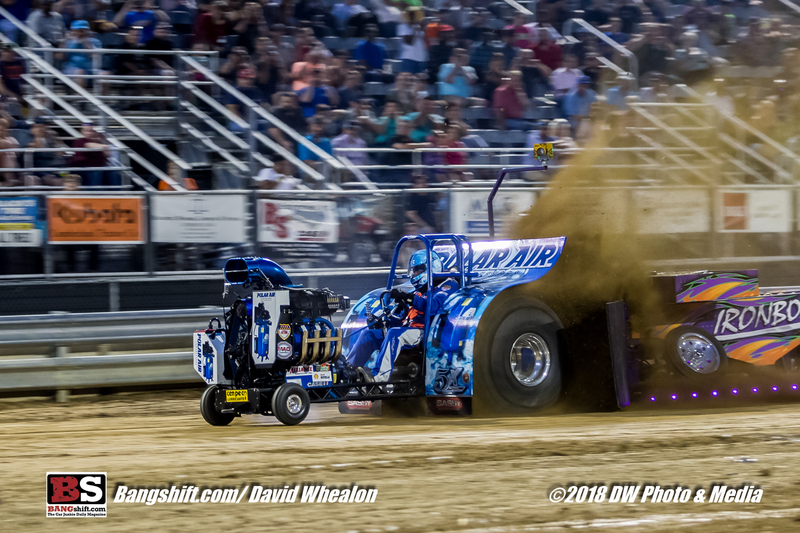 Next was Nick Carter and his "Clean Burn" Western Star driving on 5 wheels he was, pop, pop, popping down the track ending up at 350.51. Next came Street Semis and first off I gotta tell you Brandon Terrell's new road tractor is nothing short of amazing. I talked over my footage it was so good. To knock a photographer/video guy off of their game, it has to be amazing. How amazing, you gotta watch the video. Another note was a truck called "All Shot Up" and it literally looks like it was driven through Hell and back. The video will have to tell the story of that truck. L L Carter all hooked up real good in the Street class and made it to the finals. 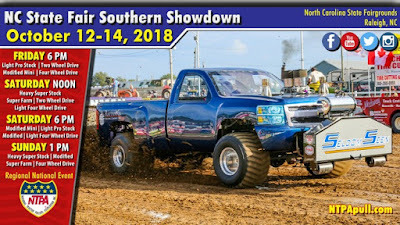 In the finals, an L L Carter truck won. It was Teddy Woodie in his white Freightliner. Hot Farm tractors. This class has exceeded my expectations yet again. On night 2 of this show, Adam House got the show started. He dropped a decent hook of 258.20 as it just wasn't right. Next Kenny Sandridge and his Burnin' Green John Deere went 295.25 with some awesome wheelies. Next, Dustin Reynolds took his Pulling Teeth International some 297.47 proving paint don't pull. Shandy Turner got "Foolish Fun" right and went 310.72. Shandy had been fighting this tractor all year. You know it is going to be a struggle when you build a tractor, take it outside only to realize it was too tall to get out of the garage. Jason Bowers came toward to the back of the pack and went 322.35. This is one of the best looking Internationals you have ever seen, letting you know, "Well, maybe paint does pull!" This thing is so hot, it looks like it is going 30MPH sitting still. Derek Brinkley came in second going 316.79. Derek is a regular on WWPTV, always willing to give a sound bite. Pro Stock 4x4 Trucks. This is the most competitive truck class in the world. So many trucks can pull as many as 17 this season and 5 or 6 of them will be within several feet of each other. On this night hometown puller, Tommy Henley went first and had a good run of 320.38. Next came the mountain man Grey Perry and his "Big and Nasty" and went 331.65. Rookie Wint Parker came next and went on 324.57 his white Chevy called "Haulin Grass". Next came Wesley Keys and his "Black Ice: The Sequel" and went 327.20. Wesley bought the old truck of Kevin Schools and Bunky Davis before that. Wesley added his touches to the truck and it has paid off. Gerry Young came to the back of the pack on his Haymaker Chevy had a hiccup mid-track and still managed to go 331.65 to take the top spot on this night. Dennis Laing came next on his beautiful Chevy called "Flirtin' with Disaster" and went 328.92. The belle of the ball was Kathy Jewell. She and her "Tenacious" Chevy-powered Dodge went 328.11. Again, this is one of those classes that you just never know who is going to win it. I dare to try to predict it! V8 Economy Modifieds. Well, let's just throw out Economy. V8 Modified Tractors, that sounds great. You travel enough with this league and you are bound to love hanging around this bunch! Fresh BLT's, Hot Dogs, Hamburgers, cold drinks, you name it. This is the camping bunch of the group. The pull is 1 hour away, no problem, well take the campers! On this night, hometown puller Rocky Meadows got the first hook. Flashback to 2017 and son Bobby pulled the "Buckeater" Oliver and smoked his right rear tire off. Rocky didn't have that problem this year. He took his Chevy-powered Oliver 313.65 feet. Hugh Crittendon came next just 20 minutes from home and went 323.92. Twenty minutes from home, still camping out! Gary Coffey came next and went 321.59. Last but not least, class and self-sponsored by James River Equipment "The Gambler came and went 334.59. Earl McCray came last and had a rough ride to finish out the class. Super Pro Farm. What is the difference between Pro Farm and Super Pro Farm? "It just sounds different!" Thuman Munford Sr explained to me once. He got the first hook and went 330.29. Okay, everybody else can go home. Thurman's done. Not really, but once Thurman hooks, you know how far you gotta go to win. It is that simple. Nine other pullers came after him and he just sat and watched them all try to catch him. Stablemate E L Harlow and his "Harlow Harvester" came and put down a 327.41. Billy Rice and "Lights Out" put down a 325.48. And Donnie Gochenour came in 4th with a good run on "Double Trouble" and 324.57. Other notes Bryan Wright drove for class sponsor Chad Nesselrodt as he was getting ready for Fear Forest (http://fearforest.net) so he was away. Bryan went 314.66. 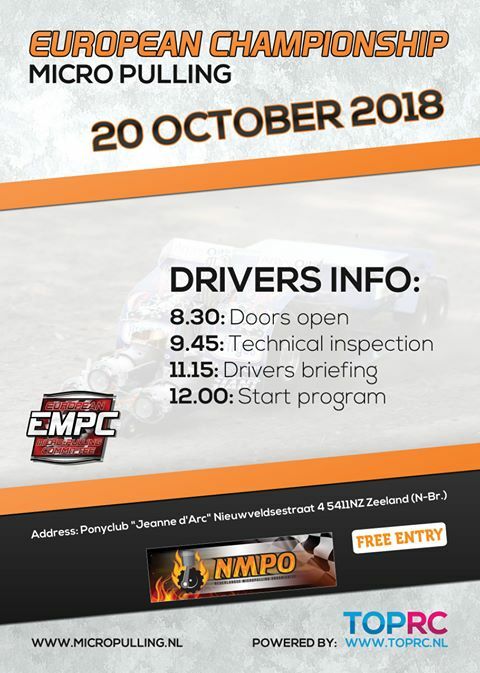 National Modified 4x4 Trucks. Twelve trucks in this video. No joke. I can't craft something that funny and I was filming jaw open like a supermodel walked past me. John T Davis watched Rebecca Brizendine go first and lay down a fine run of 309.41. John T said, no problem, I got this Sonny powered Chevy called "The Legend" and all we do is dirty work on the pulling tracks with our trucks. He went 315.62. This rolling chassis is still for sale. Contact him for inquiries as well as all your insurance needs (804-445-3823). Bother Peyton is a pretty good puller I hear. Hey took his Young Gun and went 313.10 on the last hook just about. So much for the track going away. Jake Cramer came in fourth going 308.39 on "Supernatural" Jake told me last year, "it gets a lot of compliments as a lot of people identify with this truck". 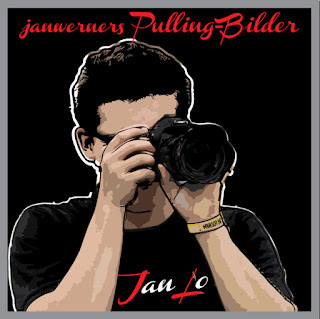 Pullers keep in mind your vehicle could be the source of inspiration for many. I have a national database of names if you need ideas, let me know. 7800LB Light Pro Stock. How much power can you get from a 466 cubic inch motor? Anywhere from 1200-1500. That is what these guys are getting and it is not a joke. This is one of the largest covering class on the East Coast. Sometimes we will have 10-17 tractors in this class. Numbers have been down in several leagues lately though and with more rumored to step up to 8500LB Mod Turbo, those numbers are sure to take another hit. Let's not get so down on that, moving up is a good thing. On this night we showed 4 tractors. And we finish the class the way we start it. Steve Flint came first and dropped his sub-300 foot hook to go back to the rear of the pack. Paran Bean came next on his Allis Chalmers D-21 and went 317.14. Ragan Davidson came in on Barbie Cox' "Demo Deere". Ragan is a big help to this event as is Barbie, and Ragan will drive Semis, this tractor all over to help the S.B. Cox, Big Cox Motorsports to shine. On this night Ragan came in third going 301.97. Steve Flint came back on his "Headcase" MX275 to take it home at 323.06. US Guestpuller for the 2019 European Superpull is known ! 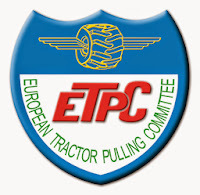 The US Guestpuller for the 41st edition of the European Superpull in Ahoy, Rotterdam is known. 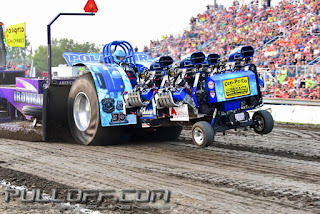 The organization of the biggest Indoor Pull in Europe have announced last week Joe Eder from North Collins, New York in the USA will bring his Unlimited Modified and Mini Modified Tractor called ,,Polar Air´´ to Rotterdam next year. 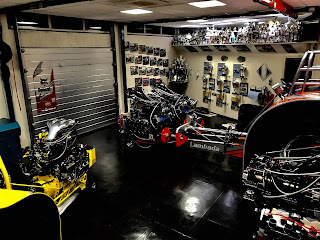 Joe´s Unlimited Mod is powered by 4 18-71 SSI blown Sassy Racing V8 Hemi engines on methanol. The Mini Mod is powered by an Mike Janis blown Sassy V8 Hemi engine. The Mini is the former 2017 Bobcat Jr. of the Boer Family from Ijsselmuiden, in the Netherlands. Joe Eder is a very successful pulling competitor and he´s a 5 time National Champion in the Modified Pulling division. Joe won 4 NTPA Grand National title and 1 Lucas Oil PPL title in the past. 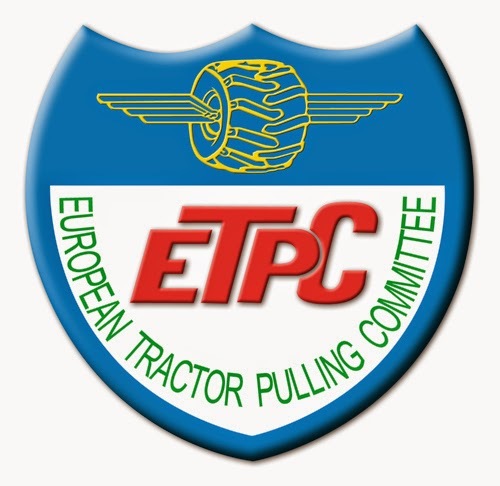 The 41st Edition of the European Superpull is at the 16th of March 2019. 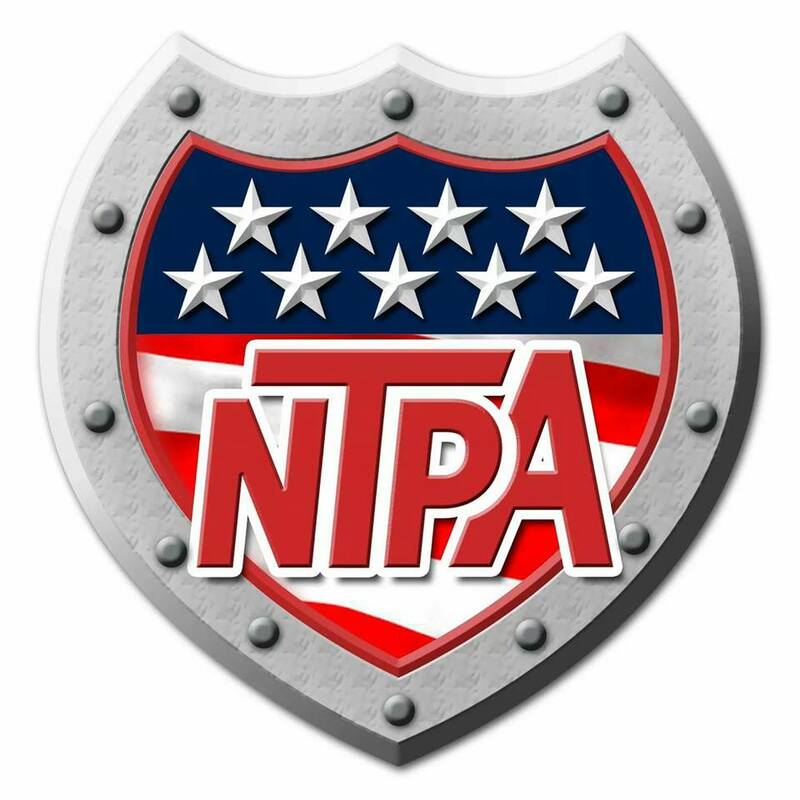 Congratulations to all 2018 NTTO Grand National & National Champions ! The new pullingworld.com calendar for 2019 is in the tractorpullingshop avaiable now. 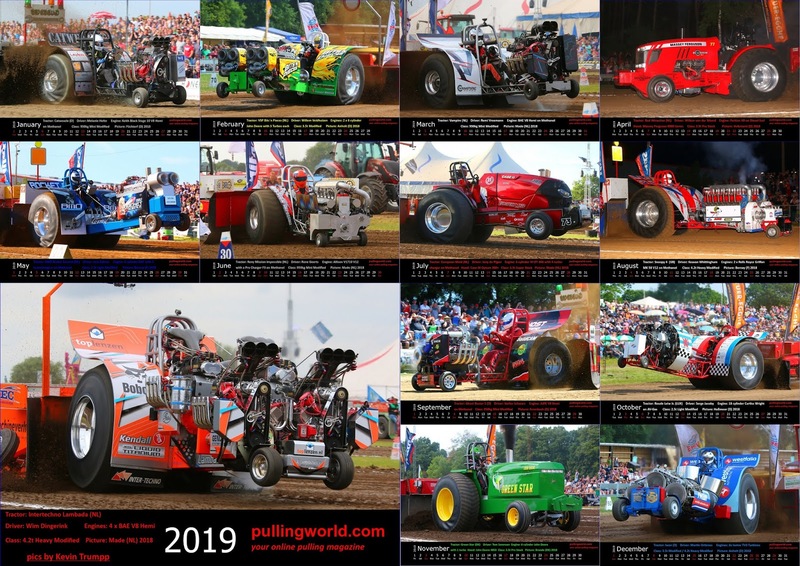 In the new calendar are 13 different Pulling Tractors, like the new European Maid Super Stock from the Netherlands, the new Catweazle Mini Mod from Germany or the new BMO Rocket Science Light Mod from the Netherlands. The calendar is avaiable for 16.95€ each. The Lambada Pulling Team from Zwolle, in the Netherlands have announced on their facebook site, that they will not compete at the 2019 Indoor Pulls in Zwolle and Rotterdam. 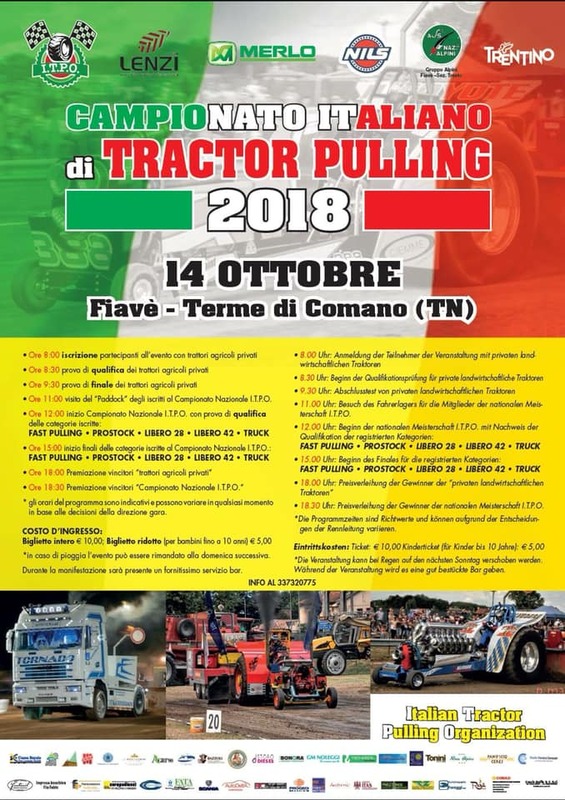 After a rough season with a lots of engine damages the Team decided for the upcoming winter to keep the focus on the maintenace on both Tractors to get more reliability in the next season. 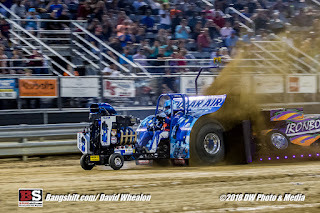 Unfortunately we have to announce to our fans, sponsors, friends and promotors that we will not participate in the indoor pulls in 2019. Last season was the toughest season for us in terms of maintenance and damage. We are very thankful we could finish the season with all the help we received. We decided that both machines need a lot of maintenance and new parts to get more reliability in the next season. Also we will use the extra time to find new sponsors, make new merchandise and start the Lambada VIP membership. Enough to work on. We will keep you updated with posts during the winter time and hopefully we will see you in the next ourdoor season! 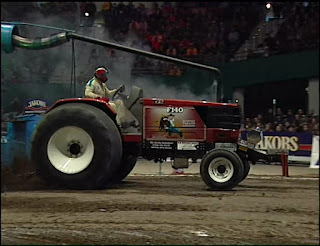 The Zapo Pulling Team around Bennie Harmelink and Theo Broekhuis say goodbye from the Tractor Pulling Sport. In the beginning of the 2018 season, the team owners Bennie and Theo decided to retire from the Pulling in the end of the season. 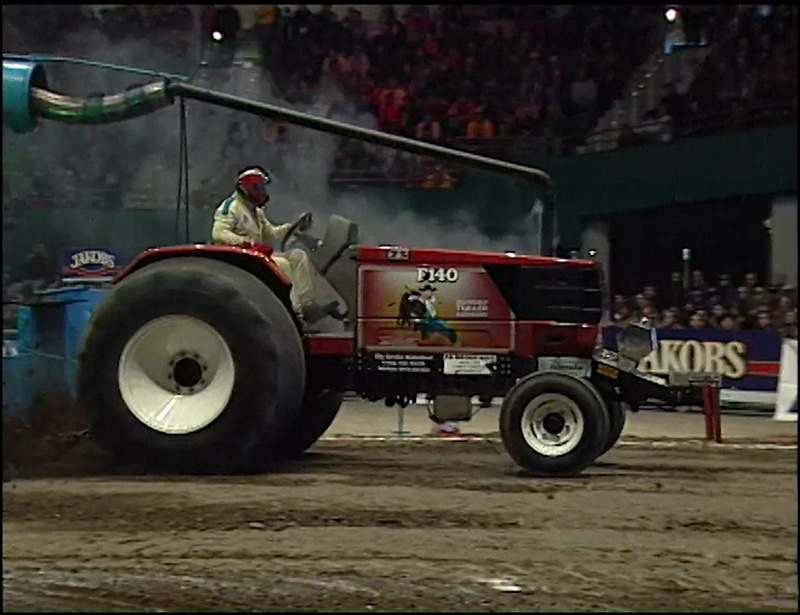 The Dutch Team from Bathmen, in the Netherlands was 31 years active in the Pulling Sport. 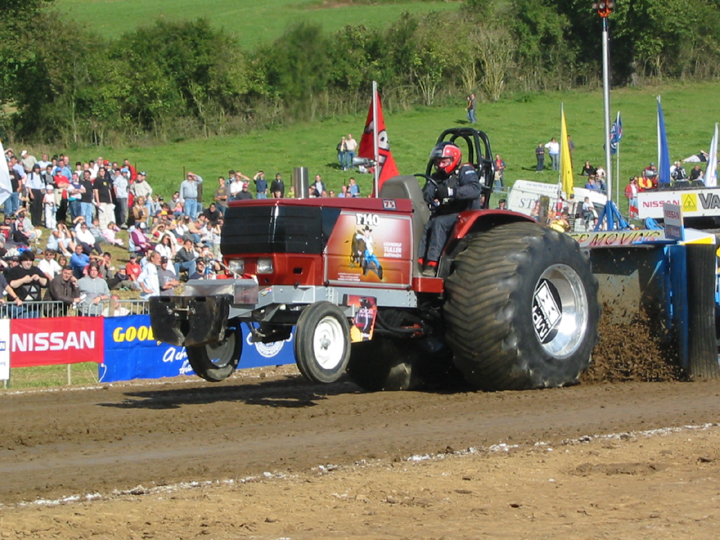 Bennie Harmelink and Theo Broekhuis started participating in regional Tractor Pulls in 1987. They pulled with two Tractors namely a Fiat 980 and a Fiat 1000. Many prizes were achieved by them. In 1991 the Tractor called ,,Torrino´´ of Kees Clemens was purchased. This Tractor was twice Dutch Champion in 1986 in the Super Stock class at the NTTO. After they having won everything in the regional competitions for two years, it was time to look further. The Tractor had now been given a name: ,,Zapo´´. A combination of the two house names of Bennie and Theo: "Zandvert" and "Pöste". In the year 1994, they started at the NTTO Pulls. In the following year there was pulled with 3 turbos and a relatively small 5.5 liter engine that still had difficulty to perform well in the strong field. In the winter of 1995 / 1996 a complete new Tractor was built with a 8.2 liter Fiat engine that was drilled up to 8.5 liters. A completely new hood also was purchased. 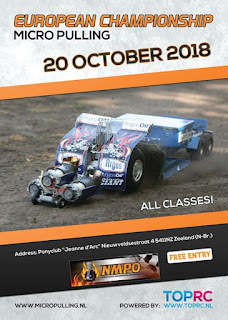 The years 1996 to 1999 were years with good results such as a second place in the Dutch Championships in the 4.4t class and a sixth place at the European Championships. In the winter of 1999-2000 they switched from diesel to methanol. In the first year they had some difficulties, but at the end of the season it turned out to be fairly easy to master. In 2005, a start was made on building a new Zapo. The familiar Fiat Winner hood was replaced by a New Holland TVT 190 hood and the frame also was renewed. The engine was replaced by a 6 cylinder Cummins on alcohol and the gearbox became a reverser. The new Component Super Stock made his maiden voyage at the Dutch Championship round in Cadzand 2006. In 2008, they finished in runner up position at EC in Bryne, Norway. In the end of 2009, Zapo received the ,,NTTO Puller of the Year" award. The best season what the Team had was 2015. 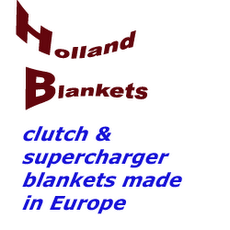 They won the Dutch Championship and finished in 2nd in the Euro Cup point standings. They also received for the second time the ,,NTTO Puller of the year award´´ in 2015. 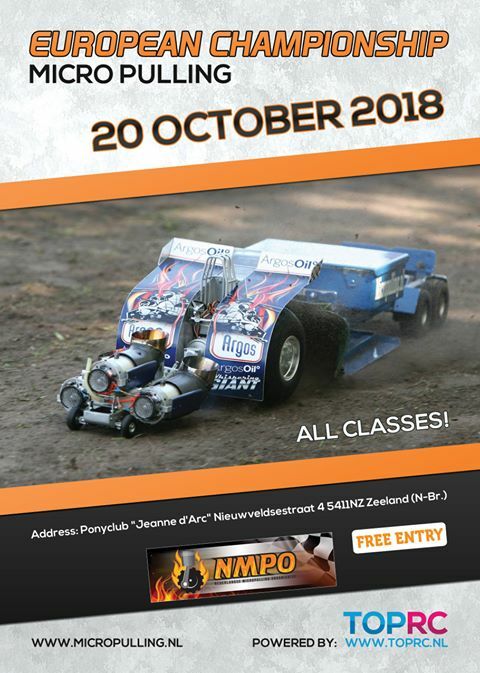 2 years later in 2017, they won again with their Tractor the Dutch Championship for the second time. This year in their final season, the Team took another 2nd place in Euro Cup point standings. Defnetly a nice end for the Team. The last and final hook for Zapo was at the European Championship in Alphen, the Netherlands. But it wasn´t a lucky day. After 20m a planetary gear broke in the rear axle and all chances for a good placement were gone. Only the last place at their final pull. During the event, the team said goodbye and thanked all fans for their support over the last years. What will happen with the Tractor. During the weekend, they announced the New Holland Tractor is sold to Germany. We will see in the next weeks and months who has purchased the Tractor from Germany. We would also like to give a big thanks to the Team for the support during the last years and wish the whole Team good luck for the future !